Accounts payable departments process hundreds of thousands of invoices annually, most without error. Unfortunately, supplier billing practices, incomplete or inaccurate invoices and challenges with ERP controls contribute to duplicate payments, overpayments and other errors. While the total number of occurrences is small on a percentage basis, the aggregate loss can be significant. 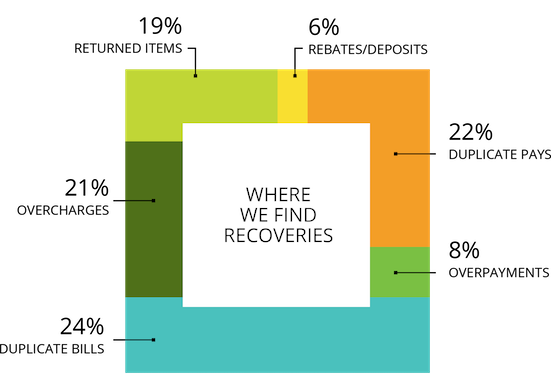 Revenew’s unique methodology enables us to explore and recover transaction and contract losses – consistently delivering greater detection and recovery than can be achieved in-house or by other firms. Revenew specializes in companies with complex Accounts Payable systems. Our audit team members have considerable experience working as accounts payable managers for large Fortune 100 companies. Based on their insider knowledge of a corporation’s structure, we developed the most comprehensive, efficient and minimally-intrusive recovery system available. "Revenew's initial vendor audit was more than double the previous highest recovery amount on an Accounts Payable audit ever performed here." Our gainIQ predictive analytics software and unique methodology contribute to the unparalleled results we achieve. While most firms run 10 to 15 reports on your data, our proprietary programs perform over 40 tests, with 70 root cause analyses. All presented claims are agreed to by your suppliers and validated against your system. Robust technology, proven through 275,000 hours in the field. Proprietary analytics leverage our audit history data – our tribal knowledge. Better data yields greater detection and higher recoveries. Our gainIQ statistical analysis accelerates audits for a faster, more efficient process. Predictive insights and recommendations help you to prevent future losses. Learn more about how Revenew’s Supplier Payment Reviews reveal more, to recover more.